I have been challenged to spend the next 40 days writing reflectively on the resurrection of Jesus. That’s how many days there were between his resurrection and his ascension (Acts 1:3). It won’t be daily, but I am going to accept the challenge and continue to contemplate the meaning of what we celebrated yesterday on Easter Sunday, something deserving far more than one day or even one week of careful attention. The resurrection of Jesus Christ is the greatest moment in history. Out of curiosity I did an unscientific survey using Google to see what others deemed to be the most important events in history. As you might expect the answers were all over the place including world-wars, inventions, and revolutions. Several mentioned Jesus’ birth and death. I didn’t find any that specified His resurrection. Many believe that the life of Jesus Christ was world-impacting. But the life of Jesus alone isn’t the most important moment in history. His resurrection is. By his resurrection Jesus proved that he was who he claimed to be – God. If He didn’t rise from the dead, then he isn’t God because if he didn’t rise from the dead he either had an over-inflated view of himself and his ability or he outright lied about what he could do. God doesn’t overstate his case and he certainly does not lie. If Jesus said he would rise from the dead but didn’t then he is morally inferior to God and thus not God. If he didn’t rise from the dead then Death was greater than Jesus. Nothing and no one is greater than God. If Death is stronger than Jesus, then Jesus isn’t God. If Jesus isn’t God, then he isn’t the world’s Messiah-Redeemer. He may have been a good man who brought hope to his people and set an example for the world. But death is universal and if it got him and held him, then it still reigns as our ultimate finality. If Jesus isn’t the world’s Messiah-Redeemer, then we’re still waiting for him or her or it to come. We’re still looking. We’re still trying to figure out how this messed-up world can be fixed, perhaps even wondering if it can be fixed. But Jesus did rise from the dead. The world’s Redeemer-Messiah has come. For three days his beaten, bloodied, pierced corpse lay in a cold, dark tomb. No signs of life. No breath. No heartbeat. No movement. Just an icy-cold body lying in icy-cold silence. But suddenly the closed eyes of Jesus opened. His body that was one moment a lifeless icy-cold corpse got up, pulsating with life. Leaving the grave clothes behind he came out of the tomb. He presented himself to those who knew him best (hundreds of eyewitness according to 1 Corinthians 15:5-8). Jesus was alive. Having gone head-to-head with Death he came out on top. He swallowed up Death in victory. 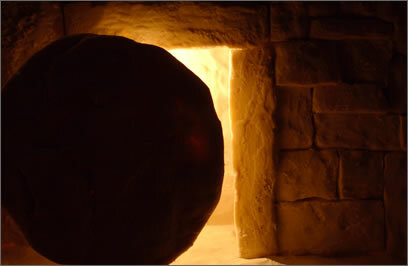 Since the resurrection of Jesus has made possible man’s reconciliation to his Creator now and forever, and since his resurrection brought the guarantee of everlasting life, and since his resurrection opened the way on the other side of the grave to heaven, there can be nothing more important in history. The resurrection of Jesus means the hope of Christians does not rest in the legacy of a dead man’s teachings but in their spiritual participation in his actual resurrection. When the eyes of Jesus that were closed in death awakened in life, that was the greatest moment in history. This entry was posted in Uncategorized and tagged Easter, important events in history, Jesus Christ, religion, resurrection of Christ, resurrection of jesus, Spirituality, theology. Bookmark the permalink. Thank you Mark for the reminder and the idea to reflect more and focus more on the greatest event in history!